That's a daylight picture of the entry above. Can you see it? We think you'll agree it's easy to miss, especially in the dark! Despite the fact that we were checking in 90 minutes later than they expected us, the owners of the park gave us a warm welcome. There was plenty of room to park and we were setup within minutes. Had this little misadventure happened when we were Bullwinkle newbies, it might have sent us spinning. But after six months of life with our moose, we took it all in stride. By the light of day, we were able to get a better look at the place. The interior roads and 70 sites of the park are made up of pavers - all hand set by the park owners, their family and a few dedicated friends. The result of their gigantic effort is a lovely park with the most level sites we've seen. We had a nice chat with one of the owners this morning who shared their story of how the park came to be. 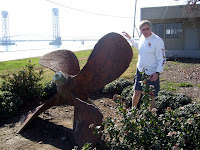 As we know, the Delta is known for its stiff breezes, especially in Summer and Fall. In those seasons, Rio Viento is a destination spot for windsurfers and windsurfing wannabes. There's even a resident windsurfing instructor! Lucky for us, the Delta breezes are absent this weekend, and this lovely park is a relaxing, quiet place for us to be. We jeeped into Rio Vista and did a bit of geocaching. Here's P picking up one near the Rio Vista bridge. We picked up four caches in no time, and are drawing very close to the milestone of having found 500 caches. We need to pick up the pace! Despite the rough start to the weekend, we've really enjoyed our stay. We may have found the "home campground" we've been looking for. We'll want to stay clear during the windy season. But, when things are calm, this place can't be beat. And, now that we know where it is, we won't miss the turn. 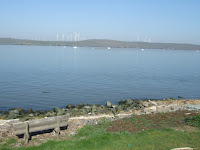 We enjoyed another gorgeous day in and around Bodega Bay. This is the town made famous by Alfred Hitchcock's classic "The Birds." And, there are a few movie-related sights to see around here. We enjoyed a lunch of fresh crab at The Tides restaurant, which is the rebuilt version of the restaurant featured in the movie. The original Tides burned down years ago, but the stunning view enjoyed by Rod Taylor and Tippi Hedren remains the same. We cruised by the schoolhouse on the hill where Suzanne Pleshette taught. It's all a little creepy! 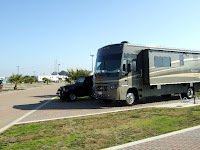 We're staying at the Bodega Bay RV Park on Highway 1. It's a fine enough park. 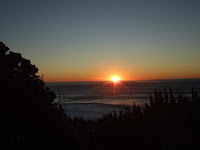 But, the best thing about it is it's a five minute drive from the Sonoma County State Beach. We headed that way just before sunset. We used our new gorillapod to snap this picture of the two of us. It's not the best - we both have that "is it working?" look on our faces - but, maybe this will prove to Gordon and Juanita that we both exist! We are so happy to have Rocky along on this trip. He's towed like a pro and taken us everywhere we needed to go. Doesn't he look happy, too? Finally, this is one of the best reasons to be in California. Sunsets on the Pacific just can't be beat. 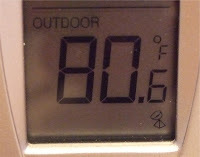 Chances are you wherever you are, the temperature is something less than this. Probably a lot less. So, we thought we'd rub it in. 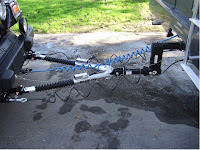 We hooked the Jeep up once again (We're starting to get good at this.) 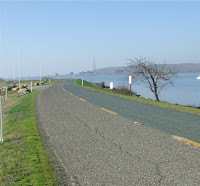 and made a quick and easy trip up the road 30 miles or so to Bodega Bay. Like most Northern California coastal towns, you can pretty much bank on cool temps and damp fog any day of the year. But, this weekend Mother Nature is treating the area to bright sunny skies, calm winds and unseasonably warm temps. Yes, we desperately need rain. But, when we're given the gift of summer-like weather on a weekend in January, we're going to kick back and soak it all in. 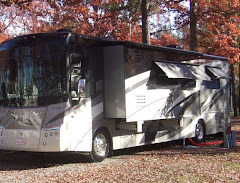 Our RVing world just got alot bigger! For the first time ever, we're pulling a "toad" (aka towed vehicle). 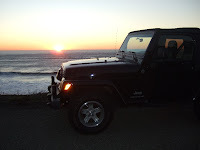 This afternoon we loaded up Bullwinkle and headed to Petaluma to meet up with our trusty Jeep Rocky, which we dropped off there Wednesday night. A few hours later Rocky and Bullwinkle were set up for towing, and we passed our hitching and unhitching orientation. (There's lots to do!) It's a pretty gnarly looking setup, don't you think? For our first towing adventure, we headed for the Petaluma KOA. Total towing distance to the yellow and red teepee: less than 5 miles. Rocky followed Bullwinkle like a good little toad. In no time, we had the Jeep unhitched and moose setup. Then, we made good use of our toad and headed off to the grocery store. We think we're going to really love having Rocky along on our trips. Returning from a quick - and not at all profitable - trip to the casino late yesterday afternoon, we noticed a definite chill in the air. By dinner, the outside temp dropped below freezing. So, P wisely unhooked and drained our water hose before we hit the hay. This morning we were up with the sun to see this very frosty scene, with an early morning low of 25 degrees. Brrrr! Thankfully, Bullwinkle's furnace kept us warm and toasty all night. From our cozy home we watched several neighbors (who didn't take precautions last night) emerge from their RVs with pans of hot water, which they promptly poured over their water spigots and hoses. Thankfully, we were spared that chilly inconvenience. Good call, P! By breakfast, the temp was heading north of freezing and everything began to thaw quickly. We packed up and pointed Bullwinkle toward the Bay. By mid-afternoon we were back at home where there is little chance of frost tonight, or ever. For our first foray into cold weather camping, we all did OK. We just don't think we'll make it a habit. 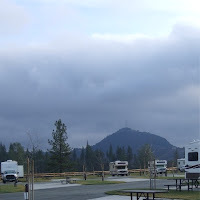 The first Saturday of 2009 at Jackson Rancheria started sunny, but turned foggy and very chilly by mid-morning. With the furnace keeping Bullwinkle cozy and comfortable, it was a perfect day to sit back, relax and watch our beloved Jayhawks take on the 18th ranked Tennessee Volunteers. 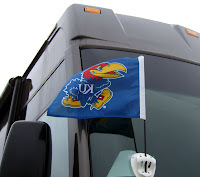 As part of our pre-game ritual, we donned KU apparel and brought out our latest KU accessory: a Jayhawk flag that was at the top of our Christmas list. From tipoff to final buzzer, the game was a good one and KU came away with a "W". Looks like our new little Jayhawk has good game karma. It's definitely a winner. With our lucky flag flying, it might be a good time to visit the casino! Our first outing for 2009 is to Jackson Rancheria, just about 100 miles from home in the rainy and very foggy foothills of the Sierra Nevada. After being home from our holiday air travels to the midwest for a grand total of 15 hours, we packed up the cats and our stuff, loaded it all into Bullwinkle and headed for the hills. Three hours or so later, we arrived. P drove through some very nasty fog to get here. There's nothing quite like driving an 11-ton vehicle on unfamiliar roads where the visibility is just about exactly the length it would take you to stop the thing. He did great. And, thankfully, the extra soupy part of the trip was relatively short. 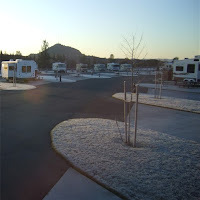 The RV Park at Jackson Rancheria is about a mile from the casino. Of course, there's a free shuttle that passes through the campground three times every hour. So, the casino is hard to miss. We'll check it out tomorrow. The park is new and lovely. Lots of room and green space. Even in the rain and fog, the views are nice. The sun is supposed to come out tomorrow, so we'll be able to get a good look. It's a bit chilly here. (Check out the weather page for details.) But, we've fired up the furnace, had some pizza, salad and chianti. So, it's toasty and cozy in our little rolling home. The cats, we are so pleased to report, are behaving like seasoned veterans. They seem to like this RVing gig! Our bodies are still on Central time, so it's early to bed for us. Perhaps we'll hit the slots early tomorrow. Who knows?